Lorenzo Baldassarri has made it two wins from two races in the 2019 Moto2 season, backing up his Qatar Grand Prix win with victory in today's Argentine Grand Prix. He held off the advances of Remy Gardner in the final laps, leaving the Australian to take the first podium finish of his Grand Prix career, just ahead of Alex Marquez. Sam Lowes crashed out of the race, losing the front after a small mistake while running inside the top ten, but fellow Brit Jake Dixon had a strong finish on his first visit to the Termas de Rio Hondo circuit in 17th. 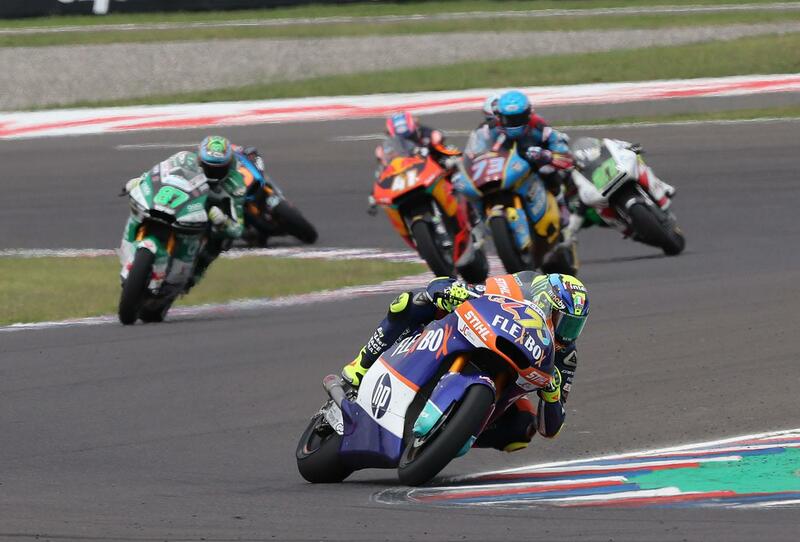 Xavi Vierge has taken pole position for tomorrow’s Argentine Grand Prix, presiding over an incredibly close qualifying session that saw 21 riders within a second of each other at the Termas de Rio Hondo circuit. He’s joined on the front row by Marcel Schrotter and Brit Sam Lowes, one of the strongest all weekend and losing out on the chance for pole position only after a huge moment on his penultimate lap. Alex Marquez will start from fourth, baulking on a pole-pace lap in the final seconds of the session, with Tom Luthi fifth and Brad Binder the first of the KTM riders in sixth. Rookie Jake Dixon will start in 28th. Returning Moto2 rider Tom Luthi has topped the first day of action for the middleweight class at the Argentine Grand Prix, ending the day’s second session just 0.092 ahead of Brit Sam Lowes. Controlling the afternoon’s session, a series of late laps weren’t enough to unseat the Swiss rider, but allowed Lowes to creep up on him despite a slow start. Remy Gardner was third, surviving a front end crash that he managed to save on his elbow earlier in the session – but lost time in the final sector in his own late effort for the top spot. Augusto Fernandez continues to impress in fourth, ahead of an impressive run for the Sky Team rider Nicolo Bulega, just ahead of teammate and fastest man this morning Luca Marini. Brit Jake Dixon, a rookie to the Termas de Rio Hondo circuit, was 30th, spending most of the day dedicated to learning the track. British rider Sam Lowes says he's looking to bounce back this weekend at the Argentine Grand Prix after a steady start to the 2019 season last time out in Qatar, with podium aspirations at the Termas de Rio Hondo circuit. Moto2: Who the hell is Lorenzo Baldassarri?